The link between bad weather and patent approvals… “the limits of tyrants”… oil wealth and rainy-day funds… and more! 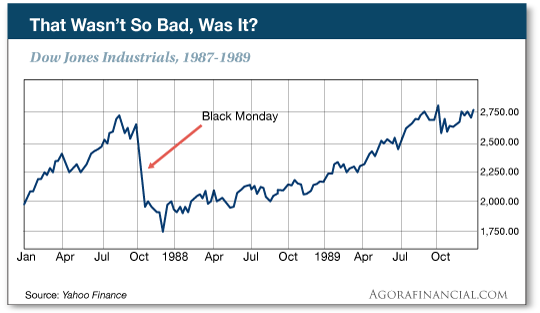 Yes, the Dow industrials suffered their biggest one-day percentage loss on “Black Monday,” 30 years ago today — nearly 23%. Today that would be like a 5,200-point loss in one trading session. 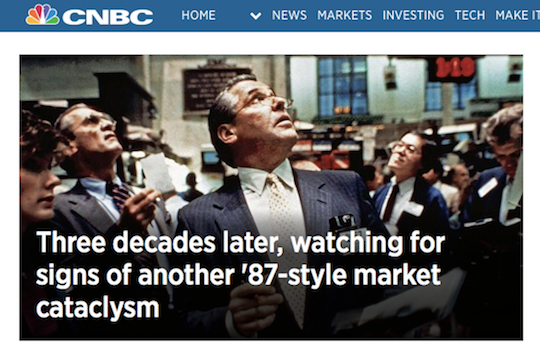 But really, how are headlines like that going to help you improve your life or your portfolio or your retirement? Just for fun, let’s entertain a worst-case scenario: What if the Dow really did experience a comparable one-day crash now? 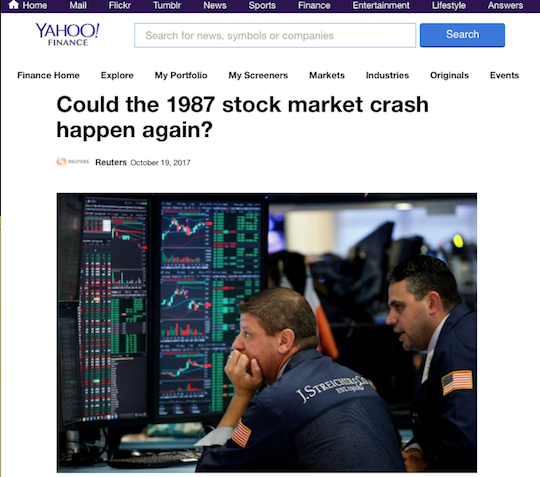 Well, assume for the sake of argument that on the Friday before Black Monday in 1987, you bought all 30 stocks in the Dow industrials. It might have seemed like a sensible thing to do — the market was already down 17.5% from its peak two months earlier. How much further could it sink? But sink it did on Black Monday, and you were down nearly 23% by day’s end — assuming you hadn’t panicked and sold during the day. 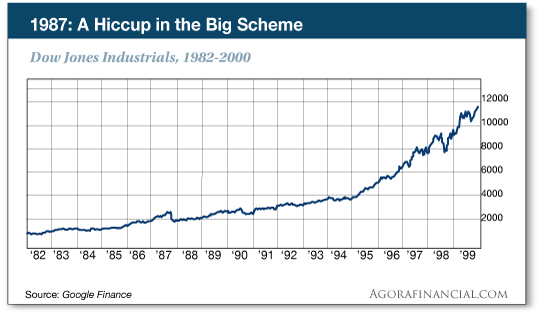 Now… What if you knew you’d recoup all those losses in the next 15 months? Even if you’d bought at the top of the market in August 1987, you’d have been back to breakeven by late 1989. Don’t get us wrong — we’re not saying that if the Dow experienced another 23% one-day crash that history would repeat. This time you’d have no idea how soon you’d recoup those losses. And even if history repeated itself exactly, that would be cold comfort if you were only a few months from retirement. But these are things the mainstream won’t tell you in its rush to crank out anniversary stories — one of the laziest forms of journalism ever. And anyway… why all the hoopla today? We don’t recall anything like this during the 25th anniversary in 2012. Maybe it’s starting to dawn on people that the market has run up too far too fast this year. At this time in 2012, the Dow was up only 8% on the year — and it experienced a sharp pullback of nearly 10% in May. In 2017, by contrast, the Dow is up 16% year to date… and we haven’t had even a 5% pullback since the “Brexit” scare in June of last year. Only yesterday the Dow closed above 23,000 for the first time. 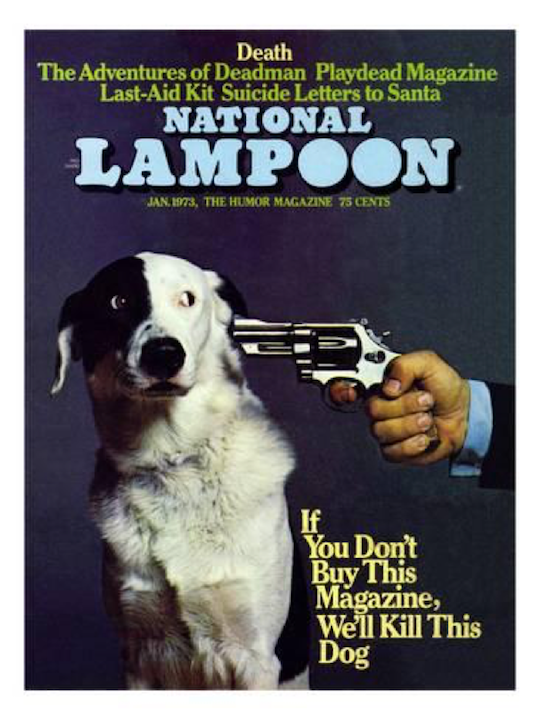 How did they get that dog to look so worried? Here’s the thing: Whenever tax reform gets done, the biggest benefits will accrue to a special group of 28 million Americans. And even if you’re not one of them… you can hitch a ride along with them and potentially turn every dollar invested into $3,000. See for yourself — no long video to watch. Assuming the morning’s market action continues a few more hours, there will be no record closes today. At last check, the Dow and the S&P 500 are both down less than a quarter-percent. The Nasdaq is down a little over half a percent. Gold is up a bit, to $1,288, and that’s not entirely a function of dollar weakness. The dollar index is down modestly at 93.1. The only mild surprise amid a flurry of earnings numbers is Verizon, which only met expectations instead of beating them. “Cash just made a big comeback in one place, and the reasons are revealing and a warning to us all,” says Jim Rickards. Jim Rickards’ take: “Even the mighty Fed, which wants you to keep cash in digital form in their banks, had to resort to paper money in a pinch. When the power goes out, so does digital money! Credit cards don’t work. Debit cards don’t work. ATMs don’t work. You can’t wire money in or out. Banks shut down. “The market needs to be properly prepared for this,” says an anonymous official with the International Monetary Fund. The Financial Times had a curious story this week about the IMF preparing to rescue Venezuela. There’s no doubt Venezuela is a basket case. The official inflation rate is 741%. Unofficially, the Troubled Currencies Project at the Cato Institute says it’s more likely 2,520%. Nearly two decades of “Chavismo” — aka socialist management — has brought the nation to this pitiful state. But the late president Hugo Chavez cut off relations with the IMF a decade ago, saying the IMF is “dominated by U.S. imperialism.” (Which it is. A broken clock is right twice a day…) The IMF doesn’t swoop into a country unless the regime agrees to let the IMF in. The salmon-colored rag didn’t say so, but in recent months the Trump administration has also talked up regime change there. “We have many options for Venezuela, including a possible military option if necessary,” said the president in August. “Rainy days and (probably) Mondays always get me down,” say the wonks at the U.S. patent office. Yale student Balázs Kovács has uncovered a weird phenomenon: Weather is a contributing factor in the patent review process. His research paper — Too Hot to Reject: The Effect of Weather Variations on the Patent Examination Process at the United States Patent and Trademark Office, — (snappy title) rolls out the evidence. “This paper documents a small but systematic bias in the patent evaluation system at the United States Patent and Trademark Office: External weather variations affect the allowance or rejection of patent applications,” Kovács contends. So the forecast for patent-pending inventions? On warm but cloudy days: stamp of approval. Cold and clear… no patent for you! “I am shocked to see North Dakota is in the RED for recession readiness,” a reader writes after another topic yesterday, “with all the success they’ve enjoyed in the oil business boom. The 5: It’s not the collapse in oil prices since mid-2014 as much as the fact that North Dakota’s oil riches are so new. “Thanks,” writes our final correspondent. The 5: Ah, but it’s those promos that pay the bills and allow us to bring you the thoughtful perspective. We’re glad you find it an acceptable trade-off! P.S. Did you play it? This morning, Jonas Elmerraji urged Kinetic Profits readers to collect nearly 100% gains on Adobe call options. Not bad for less than three months. You too can harness the power of “K-Signs” for gains that good or even better. See how they work when you follow this link.